Yew trees are some of the oldest trees in the world. Some are claimed to be 2000-3000 years old as is one found in Scotland! It measures 58 feet in circumference and about 10 feet thick! Because of the their longevity, they were often revered as sacred trees in ancient times with worship sites built near them or in groves of them. The trees were symbols of everlasting life. Vast Yew forests covered many parts of ancient Europe. Yew wood was very valuable for tools of all kinds and especially for the longbow weapon. It made the best bows because of the wonderful hardness and flexibility of the Yew wood. Even Robin Hood and his band made longbows and staffs from Yews found in Sherwood Forest. The Yew is now endangered in many parts of Europe. All of these Yews have very fancy technical names much too hard to spell or remember! The Japanese Yew has evolved into many cultivated forms. While the original variety would grow to 50 feet, the Dwarf Japanese Yew tree makes great hedges especially on the shaded north and east side of homes. It is grown in many exotic shapes from vase or cone-shaped to globular, pyramidal, or spreading varieties. The Chinese Yew is a large, ornamental evergreen found widespread in China at elevations up to 3,000 feet. Like the Japanese Yew, Chinese Yew trees can also grow up to 50 ft tall. It is quite wide and bushy when cultivated. Cultivated Chinese Yew trees make great exotic bonsai trees. 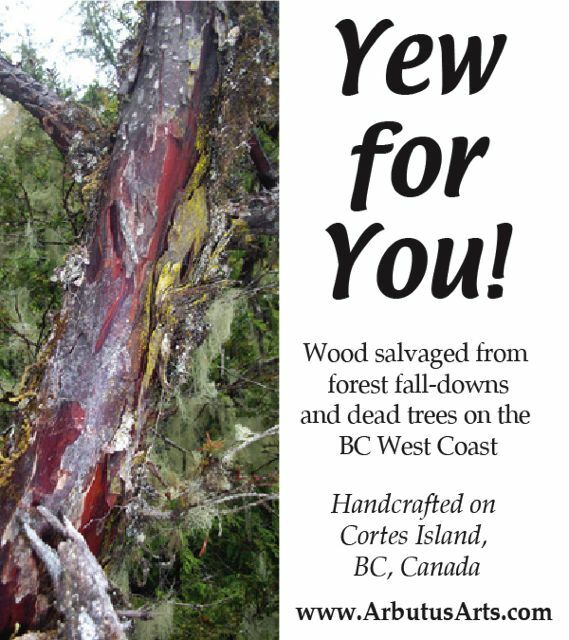 The Pacific Yew grows mostly along the coast of British Columbia and the Washington Oregon states. It is one of the hardest hardwood trees of the Pacific Northwest. It is an evergreen tree or conifer that only grows to a height of 30-50 feet and is very slow growing. This feature is what helps make the wood so hard. It has a thin scaly brown patterned bark. The wood is mostly an orange tan color with occasional gorgeous purple hues. It is a very striking wood with a lovely grain. 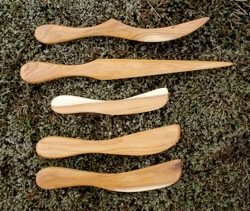 The wood is a pleasure to use to make my wood crafts as it finishes to a fine smoothness because of its hardness. And the Yew wood has an extremely warm feeling to it. You just want to touch it! 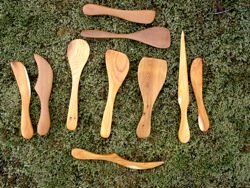 It is about the same hardness as Madrone wood and makes stunning wooden sculptures as well as fabulous non sticking wooden cooking utensils. I particularly love Yew wood for its hardness and fine finishing. It polishes to an extremely smooth texture that feels so nice in your hand! And they seem to last forever just like the tree! One of my favorites is wooden dagger letter openers. Maybe they remind me of the weapons of yesteryear! that always get a glance. 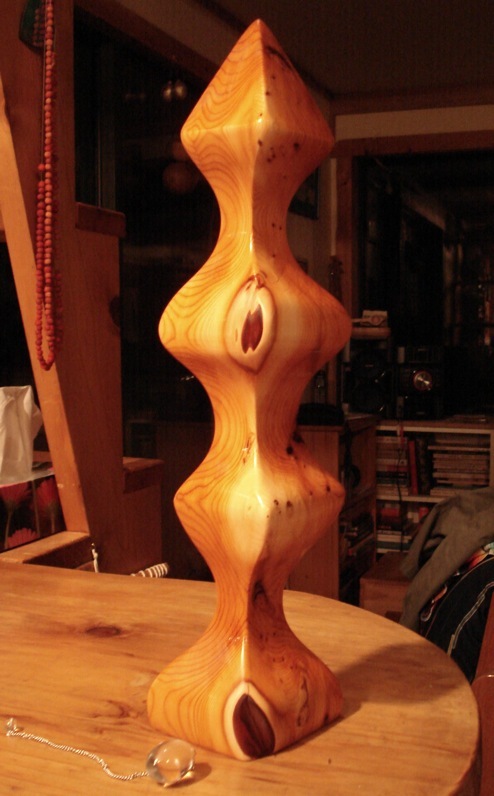 Yew Tree Wood Sculpture: "Sacred Totem"
I was instructed to make a very important carving for my use as a healing practice. The instructions were to let it emerge from the piece of wood little by little using a special pendulum to guide me. The first step I did was to choose the piece of Yew wood. I had three chunks from which to choose. I tested all three with my pendulum and only one said YES. The others were NO. I chose the YES piece. Then it sat on the porch for weeks waiting for the inspiration. Finally one day, I was able to find which way was the top and the bottom. And then which face was front and which back. Again the pendulum confirmed the choices. After that, it sat for several more days to a week. I then added a few pencil lines on it, all confirmed by testing the direction. Finally one evening I knew I was ready to carve. I took the piece of Yew wood to the bandsaw and cut the base after confirming the shape with the pendulum. Next came the top, done the same way followed by the mid sections. The whole process took only 2 hours from start to finished and oiled. I was thrilled with the result. The photo was taken back inside my home right after oiling the wood with walnut oil at around midnight. This totem is sacred to me both because of the historical significance of the wood from the Yew tree but also it now serves as a healing device for my health! ps. The necklace that you see hanging beside the totem is made from Arbutus berries. They dry rock hard. What's Your Favorite Picture or Story about Yew Trees? 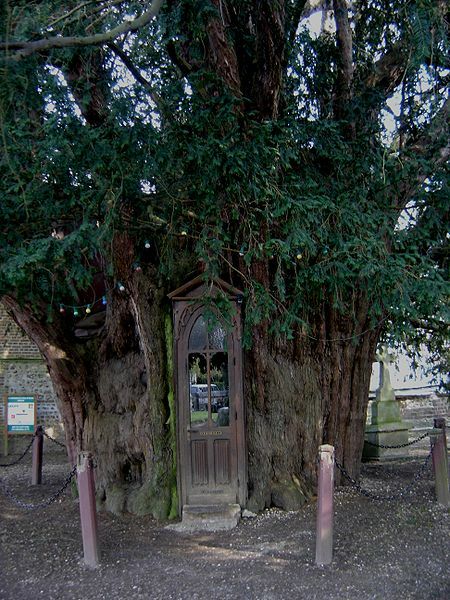 Where and when did you find that special Yew tree? What was so amazing about it? Yew Tree: I Could not cut it.